In Seeing Power the radical curator Nato Thompson describes the forces at play in, and the lie of the land for, those fields of art and activism in which he intervenes. 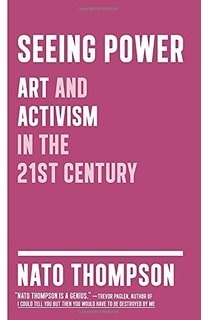 Drawing on familiar narratives – Debord’s critique of the society of the Spectacle, Adorno’ s elitist high modernist assault on popular culture, de Certeau’s privileging of tactics over strategy – Thompson carefully articulates the problematic conditions for both activism and political art in a hypermodernist, accelerated image and information-based machine of becoming capital. He describes in accessible terms, and with understanding and empathy, the ways that both individual artists and emerging alternative spaces are drawn into markets for social and cultural capital; and the equally poisonous trading in ‘exposures’ of these same self-evident betrayals. Given the relentless stream of examples of co-option, collaboration, appropriation and neutralisation, and the rigour of the theoretical critique of the relations that generate and regenerate them (critiques that never quite offer solutions or responses of the same lucidity), the test for Seeing Power is how far Thompson’s proposals for subversive interventions and the production of alternative discourses and fields can match these daunting challenges. Despite these hiccups in praxis, however, Thompson has pertinent and wonderful examples to share: the’ International Airport Montello’ that ‘re-opened’ a dying community to view, William Pope L.’s ‘The Black Factory’ that explored “blackness” through the burning, melting and chiselling of ‘black’ objects (family photos, Michael Jackson LPs, dominos) donated by members of the public and the staging of Waiting For Godot in the flood-ruined streets of New Orleans (enabled through massive community involvement). Building upon these concrete examples, Thompson proposes a spatial turn for both activism and political art. This is where Seeing Power is transformed from an impressive but occasionally uneven thesis to essential reading for psychogeographically inclined activists and radically-inclined psychogeographers.